If you know me or have followed this blog through one or two of my pregnancies, you know that I get severe morning sickness. It usually kicks in anywhere between 6-8 weeks, and it doesn't go away until I deliver. The first 17-20 weeks are absolutely brutal, and I can barely function. I didn't realize there was actually a name for that until I was pregnant with Lexie: Hyperemesis Gravidarum. Thankfully, the worst of it passes by 20 weeks, but then I end up with persistent nausea each day until I deliver, and I still throw up once or twice a day. That being said, traditional morning sickness is a picnic compared to Hyperemesis!!! So, how did I miss the first full month of morning sickness? If you remember, Liam got REALLY sick for a few weeks in July, then I ended up with what he had. The start of the morning sickness coincided with Liam getting sick. Liam had every possible symptom, so I just assumed I had the same virus as him. When I get colds, coughs, and sore throats, my gag reflex goes into overdrive, and and I get queasy. It's not unusual for me to throw up the entire time I'm sick. I had absolutely no reason to suspect pregnancy! From the time Liam got sick until the time the worst sore throat of my life went away, over three weeks had passed. During those 3 weeks, Liam ended up in Urgent Care and the ER, so my focus was on him getting better. Liam finally bounced back, but I was still struggling. In August, we had a family reunion, Lily's birthday, Liam's birthday, Liam's last week of preschool, Kindergarten transition meetings, and packing for vacation. I still wasn't feeling great, but I didn't have time to think about it. My mind was on everything but why I was still queasy. Life was absolutely chaotic, I was worrying incessantly over Liam's upcoming transition to Kindergarten, and trying to get us all ready for vacation amidst the chaos. That evening, I nervously brought up my suspicions to Grant as we sat on the balcony overlooking the beach. 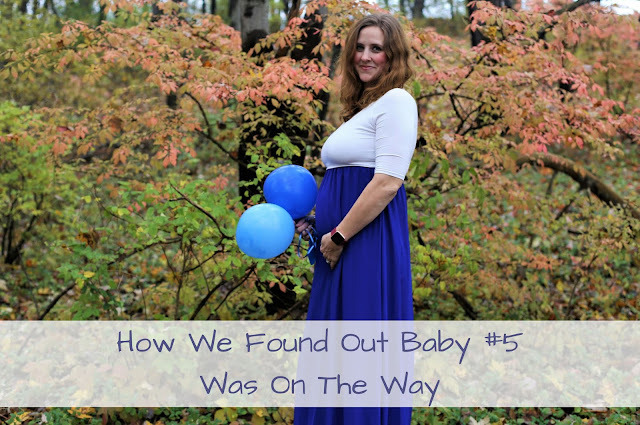 Surprisingly, he handled it MUCH better than I did, but was still uncertain I was pregnant. He just didn't think I was sick enough compared to my other pregnancies. The following day, our suspicions were confirmed as I raced to the bathroom for no apparent reason. A pregnancy test was not even necessary at that point! Based on previous history, there was no way I could hide morning sickness from the kids, so we told Dylan and Lexie that we thought I was pregnant. They were incredibly excited. Dylan's eyes literally lit up, and Lexie started to cry tears of joy. It made the shock of our discovery just a bit easier to handle. And sure enough, my morning sickness got progressively worse throughout the week. By the time we left vacation, hyperemesis had kicked in, and the 12 hour drive home was the most grueling 12 hours of my life. It actually involved a police officer, and me throwing up, barefoot, on the side of a busy highway. I'll save that fun story for another day! I was so relieved when we pulled into our driveway! 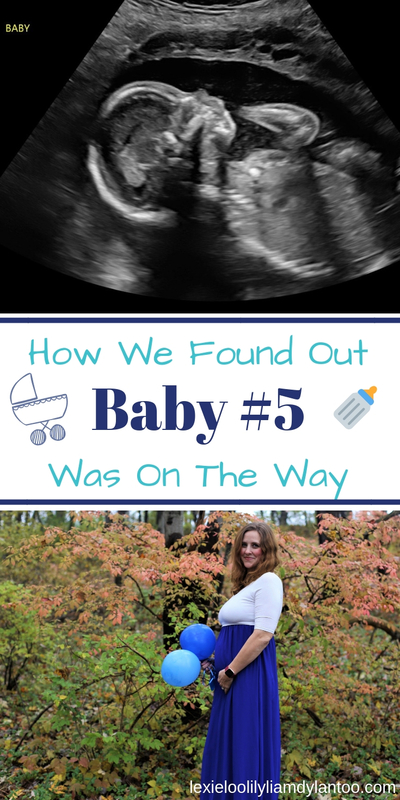 We estimated that I was 2 months pregnant based on LMP, and the timing made sense. I usually start with morning sickness between 4-6 weeks, and then it turns into Hyperemesis between 8-10 weeks. Right after we arrived home, I took a pregnancy test just to confirm, and it was an IMMEDIATE positive! We finally told Lily, who was every bit as excited as her older siblings. And that began the longest 6 weeks of my life, with quite possibly the worst morning sickness I have ever experienced. That brings us up to date! Today, I'm 23 weeks pregnant. Our 5th child is a boy, and the genetic testing we opted to have, along with the ultrasound, lowered our risk of having a child with a disability or genetic condition from 2-3% to 1 in 10,000. I'm still sick everyday, but it's no longer severe. Only 17 weeks (but most likely less) to go until we meet our surprise baby! That must be awful to be sick all the time. I hope it goes quickly for you! So exciting!! I'm glad you're feeling a little better now. Wow. Such a cool story to tell this new little one. I am sooo happy for you guys! Wow! Congratulations Stefanie! You've had a long, grueling, six weeks, but now it all makes sense. What a wonderful surprise. You're an incredible mom with the most loving family. This little boy is going to be so LUCKY and so LOVED. Sending you hugs from afar. I hope you begin to feel better soon. What a blessing! Ugh on the morning sickness. I wish you and baby all the best.